Toosh's Fashion Magazine - Who Wore it Better? Who Wore it Better #3 --Double to the what EDITION!! Hey! Its Corn and GUESS WHAT? This is called "Double to the what EDITION!!" 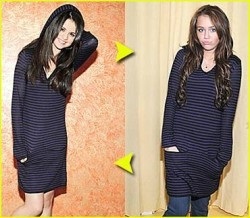 because 2 celebritys are wearing the same thing TWICE!! So I'll give you 4 of my opinions (miley, selena, miley selena). Please don't say that like "OMG YOU PICK HER BECAUSE YOU LIKE HER!" well, I think both of them are great. Selena Gomez: Adorable and awesome! The beanie hat is TOO CUTE with the dress! Smile + Pose + Accesory = 10/10! Selena Gomez: Nice! As I said, the shirt is funky. The jeans and the accesories on her bracelet and the shoes are amazing with the shirt! 9.5/10! Seleta Ebanks: Very unique! From the makeup to her skin tone (not being racist), its perfect! 10/10! Demi Lovato: Eh...from her hair and her personality, not really good to me. It isn't...her I guess... 6.3/10? This is a gorgeous dress. So if you don't know who these two wonderful celebritys are, they are Jessica Parker and Emma Roberts. Jessica Parker: Love the dress and how she is wearing but her smile and the pose seems...normal? I would give it a 6.5/10. Emma Roberts: Love her pose and the dress with those cute shoes but her smile shows a lot and looks like a fake smile? Not sure. 9/10 for her! So those were my opinion. COMMENT DOWN BELOW who looks better! Hey! I'll post 2 celebs wearing atleast one same item/clothing and I want YOU to comment who looks better.